Conspiracy, PAD Controller from Samson Technologies. 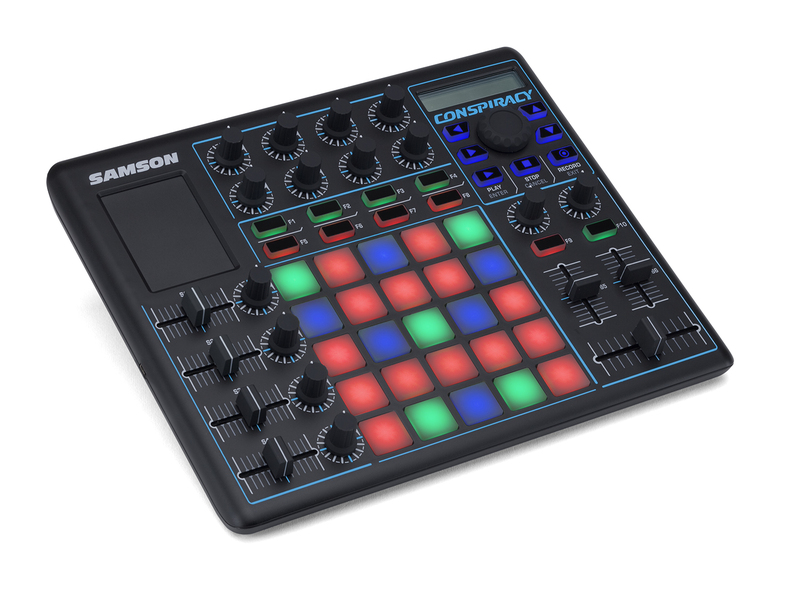 Samson will soon launch Conspiracy, a new USB-powered multifunction MIDI control surface for live and studio musicians and DJs. No information regarding the release of this new Conspiracy controller, which details are online at www.samsontech.com. A review of the Alesis DM Dock drum interface Following in the footsteps of its I/O Dock, which provided iPad musicians with a fully featured audio and MIDI interface with a docking slot, Alesis has released the DM Dock. Aimed at iPad drummers and percussionists, it’s an iOS and Mac/PC MIDI interface featuring 13 1/4” trigger inputs. It allows electronic drummers to access drum and percussion sounds from iPad apps or Mac/PC apps. Friday’s Freeware: Drumper Drumper is an original groovebox designed by Russian developer Synthler, available as a VST plug-in for Windows. A review of Sound Radix Drum Leveler If you use audio drum tracks in your productions, whether loops or multitrack recordings — you’re likely to have plenty of occasions where you wish you could adjust the levels of a particular drum or cymbal that’s mixed in with other kit elements. Drum Leveler by SoundRadix is a specially designed compressor/expander plug-in that lets you aim at those individual drums and cymbals so you can raise, lower or isolate them in the mix. It gives you a whole new level of control over your drum tracks.